COSTA MESA, CA USA – July 11, 2012 – Channel Vision, a leading provider of innovative solutions for the Well Connected Home™, is pleased to announce the release of the On-Wall Dock Station for the 2nd and 3rd generation iPad (A-0602). Apple iPad users can transform their iPads into a wireless On-Wall Dock Station. 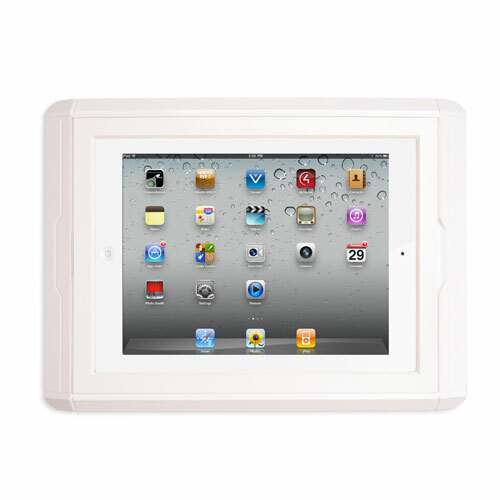 The iPad securely mounts to the wall, creating a touch screen controller ideal for home theater, whole house automation, security and AV applications. The versatility of the On-Wall Dock Station allows users to mount the iPad horizontally or vertically. The hinged cover allows for easy access to quickly remove the iPad when needed for portable use. Once the iPad is removed, users can display their favorite photo to use the On-Wall Dock Station as a picture frame. Easily view cameras from the iPad using the On Wall-Dock Station for maximum security with the Channel Vision Security App. The wireless On-Wall Dock Station creates a command center perfect for home automation and control. The iPad charges while mounted on the On-Wall Dock Station, so it will always be charged and ready to go. Channel Vision’s On-Wall Dock Station is designed specifically for the installation market and is available for purchase through Channel Vision’s distribution network of custom retailers, distributors, dealers and installers throughout the world. For additional information, please click here or visit: http://www.channelvision.com. Channel Vision is a leading manufacturer of innovative technology products for the Well Connected Home™. The Company’s broad-range of solutions are designed to provide lifestyle enhancements, while equipping homes and businesses for greater safety, convenience and entertainment. Channel Vision is proud to provide high quality, dependable products that are backed by its 5 Star Program, one of the finest customer service programs in the industry. The program includes: Free System Design & Layout; Customized Manufacturing; Free Industry Approved Training Classes, 1/10/20 year warranties and 24/7/365 Technical Support. For more information on Channel Vision’s family of products, call 800.840.0288 or visit www.channelvision.com.